So you’ve set up your blog, found your link-building partners, gotten 1,000 social followers in a week and search-optimized the heck out of everything. Ready to relax and let the inbound results flow in? Inbound marketing is (kind of) easy—it’s the ROI that’s hard. Unless you’re measuring the right marketing metrics, you won’t have a clue whether your efforts are actually bringing in new leads or customers. If you’re just setting up your analytics, or want to make sure you’re on the right track, here’s what you need to pay attention to. Measure your conversion goals, whatever they may be. I’m going to assume you’re using Google Analytics for a moment. Though the interface can seem intimidating for first-timers, it’s actually extremely easy to set up conversion goals. The most common conversion goal is a sale. You can set this up in about five minutes. The quickest way to do this is by choosing a destination URL that indicates a sale has been made—for example, a thank you page with a URL of www.yoursite.com/thank-you. Toggle “Funnel” on and add, in a list, each step a user would need to take to reach the conversion goal. This might be the product page, the Add to Cart page, the Customer Information page, the Checkout page and the Payment page. With the sales funnel in place and goal set, you can easily determine how many customers are actually using the system you created—or else find where they dropped off. Google Analytics is a vast beast, though. If you want to set up other goals and funnels, it’s not hard. It helps to have goals such as newsletter subscriptions, click-throughs to your shop’s page or contest entries. Find what’s applicable to you and get your conversion goals set up. Measure your social engagement, not just your reach. It sounds obvious to say in 2017, but advertisers and marketers care less about absolute numbers now than they might have several years ago. Facebook even has an advertising option for optimizing potential reach—but that won’t result in more clicks or better leads. Wow, more than 50,000 people reached for less than $10! But, wait—only nine of them clicked. 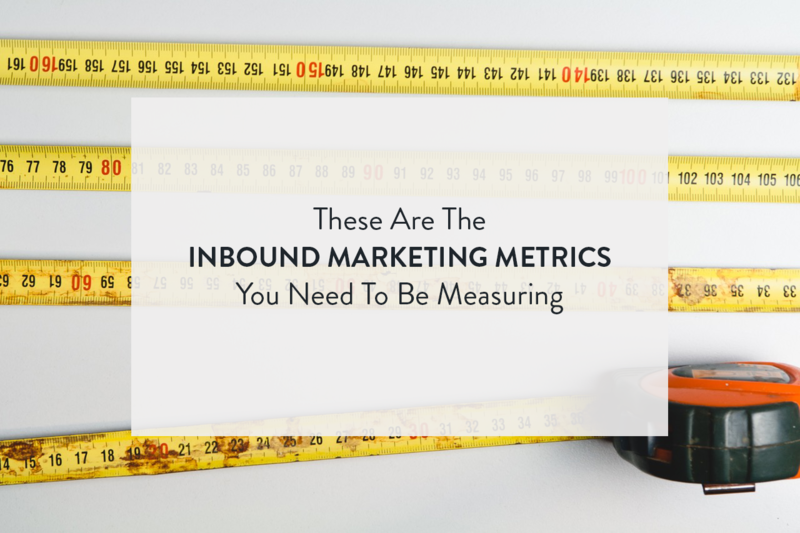 Once you start measuring your engagement levels, you can see how successful your inbound marketing actually is. Are people clicking? Liking? Commenting? Sharing? You can download analytics reports for specific times (usually a few months) from the admin dashboards of your social pages. For Twitter: Check analytics.twitter.com and click Tweets at the top to see your average engagement rate (right sidebar), and click the Export Data button near the top right to get a deeper look at a given time period. For Facebook: Toggle to your page’s Insights tab, then click Posts on the left sidebar to see how well your most recent posts have done. If you’re using the Ads Manager, the engagement metrics should be more clear-cut; if not, dig around Facebook’s built-in analytics for a rough idea of how things are going. For Instagram: On your profile (on mobile only), click the graph bars at the top right. To analyze your posts, you can click to See More of Top Posts, then sort by Engagement to see how well each of your most recent posts has done. Note that Instagram’s built-in analytics are extremely limited—percentages don’t exist and historical data is wonky—but at least it’s free. For deeper Instagram analytics, you’ll have to pony up for a paid software such as Iconosquare. I won’t get into the whole gamut of social platforms, but Pinterest, LinkedIn and YouTube all have engagement metrics of their own that are pretty easy to find. If you’re not keeping eyes on those numbers regularly, now’s the time to start. Measure your lead-to-customer conversion ratio. For this metric, you’ll need to dive into your analytics and segment your sources of traffic. You can check each source against the goal you set up earlier, which will allow you to gauge exactly how much business you’re driving from each social media channel, organic SEO, link referrals and email marketing. By parsing the data this way, you’ll be able to see what areas are working and what aren’t. If you want to use different markers to check these numbers, various social media channels offer ways to track customers as well. Facebook offers Facebook Pixel, for example, which involves a unique code to add to the <head> HTML section of your website to track users who visit from your page. That’s a nice, deeper complement to Google Analytics, which can only tell you where the traffic is coming from (e.g. Facebook), but not which post exactly did the trick. Measure your landing page conversion rates. You might have a post that went viral, garnering 10,000 views in a single day. Then you notice you haven’t sold anything based on that. Why not? Keeping track of landing page conversion rates is similar to straight-up conversion goals, but with a twist—you want to make sure you’re leading customers to the place you want them to go. Again, this could be your shop, or it could be a newsletter sign-up. This isn’t terribly difficult to check, but it’s important to make actionable changes. If your numbers are low, you can try different graphics, pop-ups, CTA phrases or even just colours. Ultimately, that’s what all this is for. Measuring your success is one thing, but knowing how to act on it—that’s the next step.